When a film announces “This is” and “This is Not Based on a True Story” from the get-go, you’re not sure what you are in for. 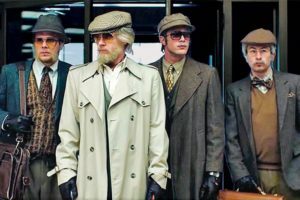 Appropriately, that is the case for American Animals, a crafty mix of the real and the unreal as it accounts for one of the weirdest heists in criminal history in riveting, neo-experimental fashion. In 2003, restless pals Spencer (Barry Keoghan, Dunkirk) and Warren (Evan Peters, Elvis & Nixon) are students at Kentucky’s Transylvania University who hatch a plan to steal the college’s rare volumes of Audubon’s Birds of North America and another rare book by Charles Darwin. After they steal them, they plan to get them fenced in Europe, but first they need to figure out how to lift the books from the library, where they are looked after by a library attendant (Ann Dowd, Captain Fantastic). Still, to them—or at least to ringleader Warren—the gambit appears easy. After recruiting Chas (Blake Jenner, Everybody Wants Some!) and Eric (Jared Abrahamson, Be Afraid), two somewhat reluctant new additions to their team, Spencer and Warren put the plan in motion but, alas, not goes as planned. Making his feature film debut, writer/director Bart Layton (The Imposter) turns in impressive work, ratcheting up the tension throughout and allowing us to know the distinctive personalities of the partners-in-crime as their perspectives and allegiances shift as they get deeper into trouble. Although there are nods to many heist films along the way—“Look, it’s Reservoir Dogs!” “Hey, it’s The Killing!”—Layton does something truly unique throughout, mixing the dramatic depiction of events with reminisces from the real culprits who recount the events that occurred and the consequences of their scheme. 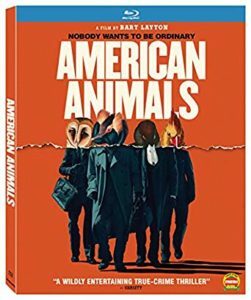 This makes American Animals something gutsy and, ultimately, special. Adding a surreal quality to the film is the fact that the introspective and artistic Spencer and the edgy, boisterous Warren– the two main con artists– conceive the heist for no particular reason. They are not financially strapped. They are simply apathetic kids who just want to have some unlawful fun. All performances are first-rate, as is supporting work by two of the most ubiquitous character actors working today: Dowd, as the ill-treated book curator, and veteran Udo Kier (Downsizing), who plays Warren’s creepy European criminal connection. 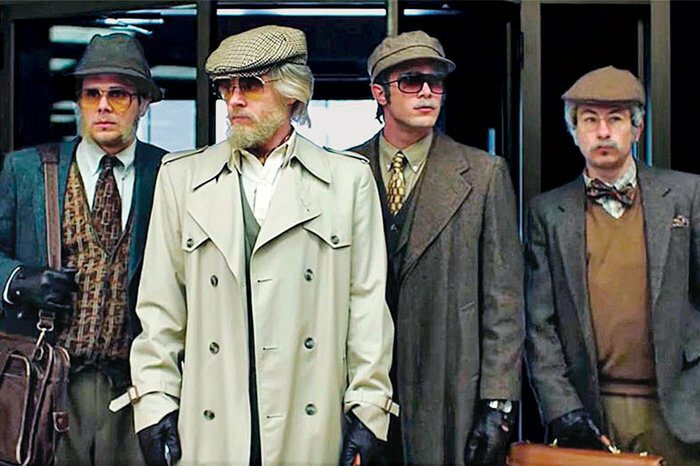 Despite some glowing reviews, a big push to distribution partner MoviePass subscribers and a healthy send-off in early limited engagements, American Animals never quite clicked at the box-office, bringing in only $2.7 million. It will likely find its footing in the post-theater market, where it should please devotees of true-crime capers and indie film patrons in search of a new way of telling a classic story.